Sara Kugel, FCRH ’11, got into journalism to cover politics. 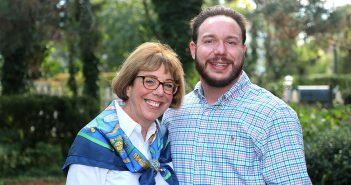 But as an associate producer at CBS Sunday Morning, she’s fallen for a different kind of storytelling. 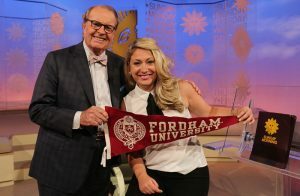 Just like the show’s host, Charles Osgood, FCRH ’54, Kugel got her start reporting in New York City as a student journalist for WFUV, Fordham’s public radio station. Her current position at CBS takes her across the country. This summer, during what Kugel calls a typical week, she attended a reenactment of Lincoln’s funeral in Springfield, Illinois; conducted an interview with the band Little Big Town in Nashville, Tennessee; produced a story on an 80-year-old Wurlitzer organ player in Los Angeles; and profiled Bo Derek at her ranch in Northern California. Some of Kugel’s favorite stories include covering a conference for Gone with the Wind enthusiasts, profiling a ship-in-a-bottle builder, and interviewing Sergei Filin, the artistic director of the Bolshoi Ballet. Whatever the topic, Kugel’s role as a producer allows her to craft each story from the beginning, to be “involved from the very spark of the idea to the completion,” she says. Kugel’s talents have helped Sunday Morning maintain its indelible status as a top-ranked morning show. The program has won two Emmys for Outstanding Morning Program during her three years as an associate producer. Each time, the staff celebrated with an ice cream party. Kugel keeps her first Emmy on the mantelpiece in her Upper West Side apartment. 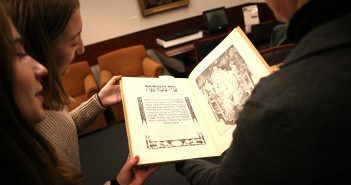 Kugel maintains strong ties with Fordham in both her personal and professional life. At past alumni events, she has discussed how networking at Fordham, and at WFUV in particular, helped jumpstart her career. In fact, each of Kugel’s three post-graduation positions—at ABC, WOR, and now at CBS—has been the direct result of a Fordham connection. “Charlie [Osgood] and I talk about Fordham all the time,” she says, adding that her core group of friends has remained the same since her freshman year. 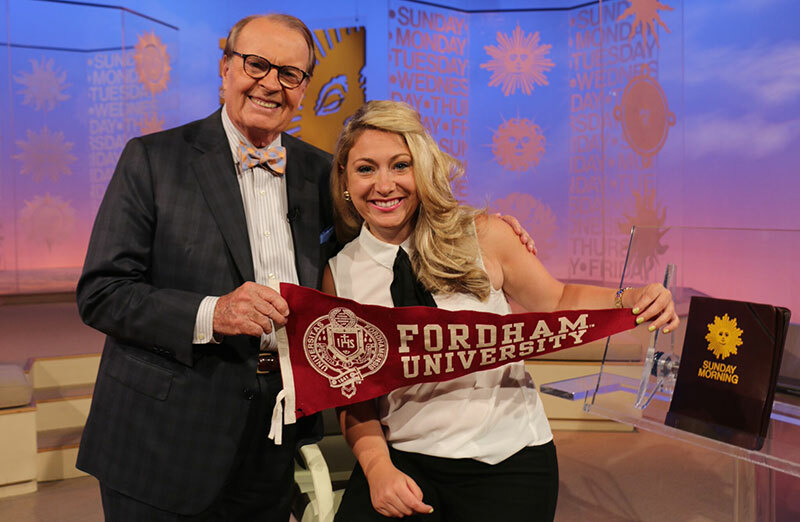 In her office at CBS, just above her desk, hangs a Fordham pennant. “Fordham will always feel like home to me,” she says. It’s part of her story.